A new sign hangs outside the closed and condemned Princeville Town Hall. It reads: "Princeville is Coming Back." It's been one year since Hurricane Matthew devastated the tiny town of Princeville. The mighty storm forced millions of gallons of water to swell past a levee along the Tar River, flooding most of the historic African-American community. When you drive up and down the streets of Princeville today, there are many signs of Hurricane Matthew’s aftermath. The fire station remains empty except for some old, soiled uniforms. The museum next door is closed. So is the only elementary school and the Town Hall. Princeville Mayor Bobbie Jones often stops by the Town Hall, even though he hasn't officiated business there in a year. Outside the building is a sign that reads, “Princeville is Coming Back.” Jones looks a little thinner and grayer since Matthew hit. 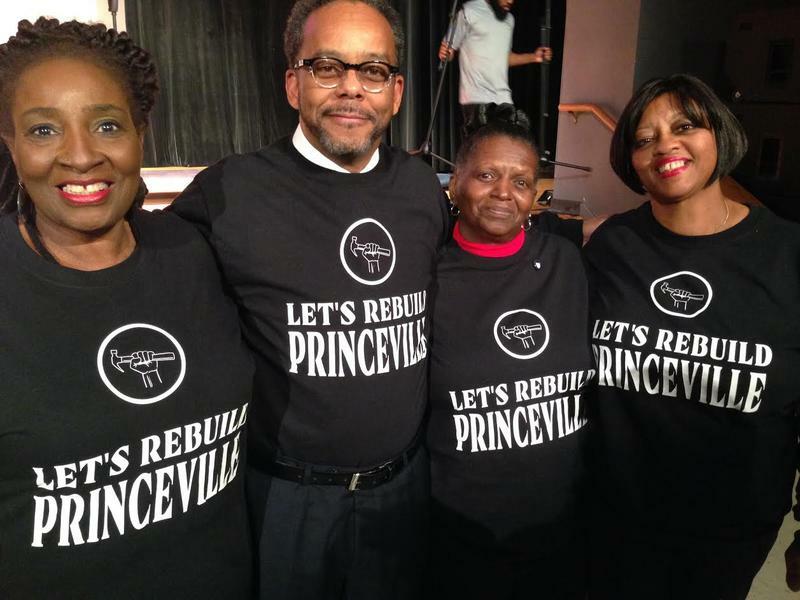 Princeville’s mostly black population is usually around 2,200 people, but many residents have not returned yet. It is believed nearly half of the town’s residents were initially displaced by Matthew’s floodwaters. Leoneda Inge reports on the Town of Princeville, one year after it was flooded by Hurricane Matthew. The brand new "Princeville Anthem" and a new Princeville flag, waving outside the condemned Town Hall, were born after Matthew’s wrath. Princeville Commissioner Linda Joyner speaking at the town celebration September 30, 2017. The Town of Princeville has some big decisions to make. When Hurricane Floyd destroyed the town 18 years ago, officials voted not to accept a buy-out and move to higher ground. This time, post Matthew, the state of North Carolina is planning to purchase 52 acres to extend Princeville’s boundaries and encourage development on higher ground. It is two miles from the town’s historic Freedom Hill, where former slaves sought refuge after the Civil War. “So it means a lot to me, I do not want to have to move off of that land, you know," said Princeville native Jeanell Person. Person was born and raised in Princeville, a couple of blocks from Freedom Hill. She left for several years but moved back after her father died. After Matthew, her family was displaced for almost seven months. Still, Person wants to stay put. “My father, he had like a ninth grade education and he couldn’t read and write and so him and my mom struggled to keep that land there and I don’t want to move from where I am,” said Person. A group of well-seasoned landscape architects and planners from across the country, along with graduate students and other experts, have come up with drawings and design-options to be considered for the 52-acre site. A mural of Princeville's history remains in tact, tucked away in a community park not far from the town hall. Kofi Boone is a professor of Landscape Architecture at N.C. State and was a part of the Princeville workshop. Boone says Princeville residents expected work by the Army Corps of Engineers would have minimized flooding. “We are Americans as well. We deserve that level of safety and protection just like everybody else. So that tendency to say, 'No, we don’t want to relocate, you all need to do your job,' is a reasonable response by a community,” said Boone. But Princeville has flooded twice in nearly 20 years. Gavin Smith, professor of City and Regional Planning at UNC Chapel Hill, is leading the design project. He and Boone say moving critical facilities like the fire department, to less vulnerable land is a real option. Smith says he understands the need to link that site to Princeville’s history. “There is unbelievable history and culture in the town but if you were to drive through it without really knowing, you might just drive through and see the one sign that says Freedom Hill,” said Smith. And with the 52 acres being adjacent to Highway 64, business options could open up, helping a tax base that is mostly reliant on home owners. Mayor Bobbie Jones can see businesses and a new housing development constructed on the 52 acres. But not the Town Hall. The design options have not been approved yet. Maybe one plan will include an elevated Town Hall, overlooking Freedom Hill. The tiny town of Princeville, North Carolina is still feeling the effects of Hurricane Matthew, which flooded this historic African-American town in October. 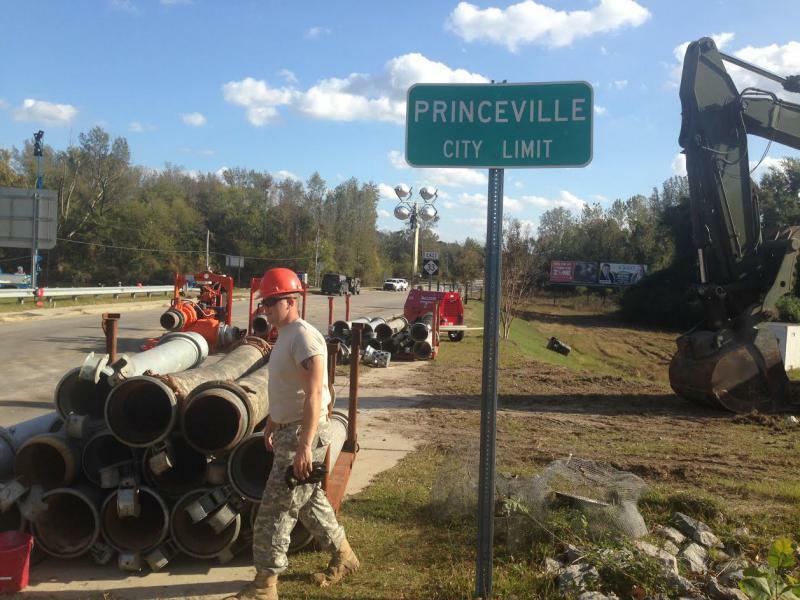 The town of Princeville is stepping up recovery efforts after flooding from Hurricane Matthew last fall. Robeson County second grader Niveah Barnes remembers one detail in particular about Hurricane Matthew. "I wanted to talk about dinosaurs when I was in first grade, but we couldn't do that, because the flood was in the middle of the school," she said.